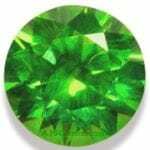 Green presents the most choices in colored gemstones, though many of the finest green gems — such as Emerald, Jade, and Demantoid and Tsavorite Garnet — are quite rare and expensive. Green hues are mainly due to traces of Chromium, Vanadium or Iron. 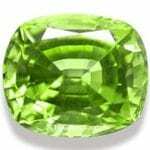 Green gemstones range in color from the bluish-green of Emerald to the chrome green of Tsavorite Garnet and Chrome Tourmaline, to the apple-green of Peridot and the yellowish-green of Sphene and Chrysoberyl. 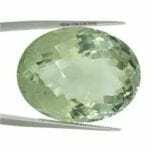 Here is a brief tour through the amazing world of green gemstones, including some rare and less familiar gems. Amblygonite is a fluorosphostate mineral and transparent specimens have been cut as gemstones. It is usually white or cream-colored but also occurs in pale yellow, brown and green. 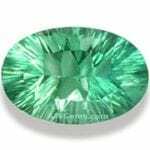 Emerald is the green variety of the mineral Beryl. It derives its unique bluish-green color from trace amounts of Chromium and Vanadium. Most Emeralds have significant inclusions, and they are usually fracture-filled with oil or resin to fill surface-reaching fissures. 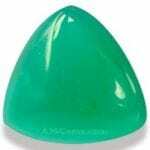 Jadeite is the most valuable form of Jade. 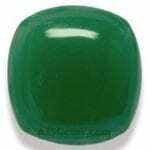 The rarest Jadeite is known as Imperial Jade or Type A Jade, an emerald-green Jade colored by Chromium. 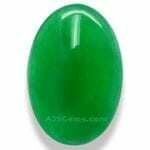 Type A Jadeite is untreated natural Burmese Jadeite where the color is 100% natural. 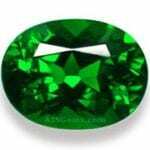 Tsavorite Garnet is a rare Grossular Garnet colored by Chromium. Discovered only in the 1960’s, it has thus far been found only in east Africa. The best Tsavorite rival Emerald for vivid color. Tsavorite Garnet is always untreated. 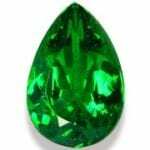 Demantoid Garnet, a green Andradite Garnet, is the rarest and most valuable of the garnets. It is remarkable for its brilliance and fire. The most valuable Demantoid comes from Russia and usually contains distinctive horsetail-shaped inclusions of Chrysotile. 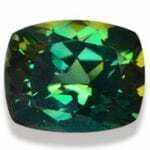 Chrome Tourmaline is a rare intense green Tourmaline found only in East Africa in the same locations as Tsavorite Garnet. It is colored by Chromium and Vanadium. Natural Sapphire occurs in a wide range of colors, including green. 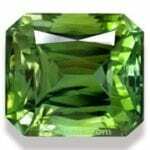 Green Sapphire is colored by traces of Iron. The green hues range from mint green to forest green, with yellow-green and blue-green quite common. Though Chrome Diopside has a saturated green that rivals Tsavorite Garnet and Chrome Tourmaline, it is a softer material (5 to 6 on the Mohs scale) so is not suitable for everyday rings. Chalcedony is the name used for the microcrystalline variety of quartz and occurs in a wide variety of colors. The most common colors are white to grayish-blue, but a rare green variety known as Chrome Chalcedony is colored by Chromium. Helenite, also known as Mount St. Helens stone, Helenite is a man-made stone that originates from the ashes of the Washington State Mount St. Helens eruption in 1980. While the volcanic ash was being removed, it was discovered that it contained glass particles that turned a beautiful green color when heated. This glass is commonly made and fashioned into jewels that may be green, red or blue. 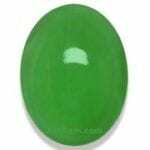 Williamsite is a rare translucent or transparent form of Antigorite Serpentine with a Jade-like color. Most specimens have minor inclusions of Chromite and Magnetite. It has a hardness of 3.5 to 4 on the Mohs scale. Gem Silica. The rarest and most expensive variety in the quartz family is a type of Chalcedony known in the trade as gem silica. Typically a vivid greenish-blue color caused by the copper content, this gem silica from Peru is a saturated bluish-green. 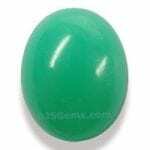 Chrysoprase, the apple-green variety of microcrystalline Quartz, is one of the rarest members of the Quartz family. Especially fine specimens have considerable translucency. 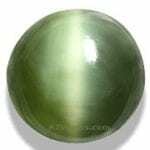 Actinolite is a mineral family that includes Nephrite Jade. Some Actinolite specimens display the cat’s eye effect. They are typically translucent to opaque and green to yellowish-green in color. 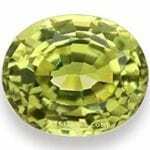 Chrysoberyl is a very hard stone (8.5 on the Mohs scale) with impressive brilliance and luster. 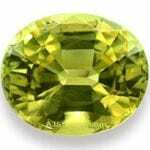 Typically a yellowish-greenish, faceted Chrysoberyl makes an excellent jewelry stone. Sphene is a rare collector’s stone famed for its high refractive index and exceptional fire. Colors range from orange and brown to yellow and green, with colorful flashes of a rainbow of hues. Sphene is fairly soft at 5 to 5.5 on the Mohs scale. Gem-quality Idocrase is rare, and is usually green in color. It can easily be confused with Peridot. Most Idocrase is opaque and transparent material that can be faceted is very rare and collectible. Mali Garnet is a mixture of Grossularite and Andradite Garnets, and is a fairly recent find, discovered only in 1994 in Mali, West Africa. 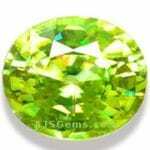 Though generally lighter in color than Demantoid, it is valued for its fire and its rarity. Prasiolite, Green-Quartz or Vermarine is a light green form of Quartz, a silicate material chemically silicon dioxide. Prasiolite is one of several Quartz varieties. Since 1950, almost all natural Prasiolite has come from a small Brazilian mine, but it is also seen in Lower Silesia in Poland. Naturally occurring Prasiolite is also found in the Thunder Bay area of Canada. 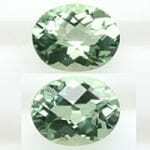 Prasiolite can be confused with the similarly colored Praseolite which results from the heat treatment of Iolite, a variety of Cordierite. It is a rare stone in nature; artificially produced Prasiolite is heat treated Amethyst. Most amethyst will turn yellow or orange when heated producing Citrine. But some Amethyst will turn green when treated. Currently, almost all Prasiolite on the market results from a combination of heat treatment and ionizing radiation. 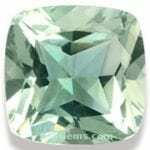 Natural Prasiolite is a very light, translucent green. Darker green quartz is generally the result of artificial treatment. 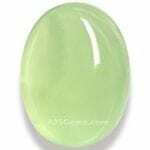 Prehnite occurs in a soft yellow-green to apple-green color. Many specimens have a luminous quality. 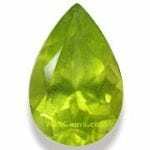 Prehnite is medium hard (6 to 6.5 on the Mohs scale) and most gem-quality specimens are translucent and usually cut as cabochons. Oligoclase belongs to the plagioclase feldspar family of minerals, which includes sunstone and Labradorite. Transparent specimens of Oligoclase are rare.